This is a vigorous, densely branched, erect small tree, that eventually grows as wide as it is tall. 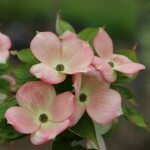 The soft pink bracts slightly overlap and appear in the spring, about the same time as C. Aurora. 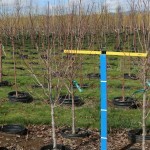 The intensity of the pink can vary from season to season with the growing conditions. It is a hybrid of C. florida and C. kousa. The foliage is disease resistant and turns a bright red in the fall. One of the Stellar® series from Rutgers.